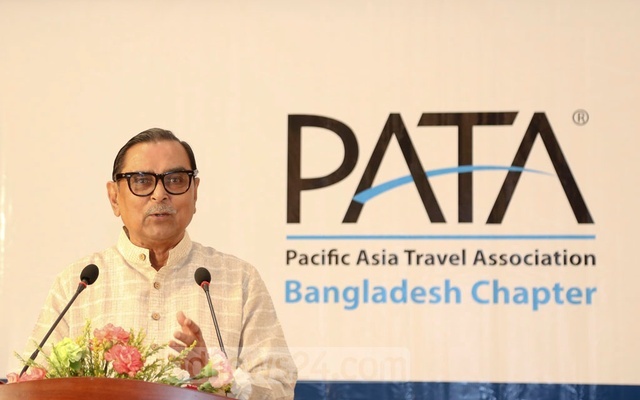 Bangladesh Chapter of The Pacific Asia Travel Association or PATA that promotes the responsible development of travel and tourism has awarded 15 individuals and organisations for their outstanding contributions to the tourism sector. 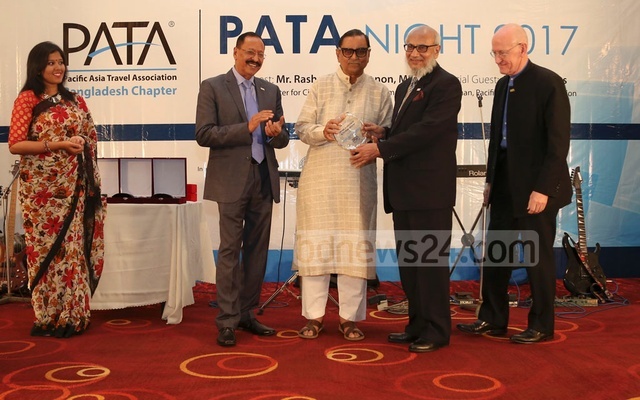 Recipients received the trophies from Civil Aviation and Tourism Minister Rashed Khan Menon at an awards programme, PATA Night 2017, at Dhaka Regency hotel on Saturday. 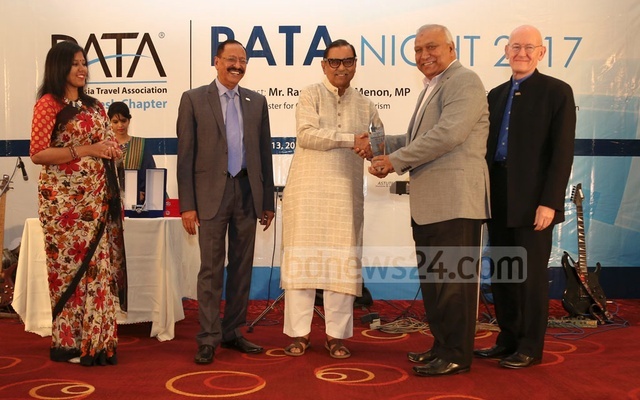 Menon was flanked by PATA Chairman Andrew Jones and the association’s Bangladesh chief Shahid Hamid. Awards are a great way to show respect, provide inspiration and create motivation to many others in the tourism industry, Menon said in his speech as the chief guest. Highlighting the government’s efforts for the development of the tourism sector, he said the inauguration of the 80km marine driveway by Prime Minister Sheikh Hasina would help realise the promise of Cox’s Bazar. “It will attract a huge number of local and foreign tourists and help accelerate the district’s socioeconomic development,” the tourism minister said. ‪The minister also mentioned the effort to modernise Cox’s Bazar airport, saying its runway expansion and planned developments would unlock potential and allow tourists to enjoy the beauty of the world’s longest natural sea beach. 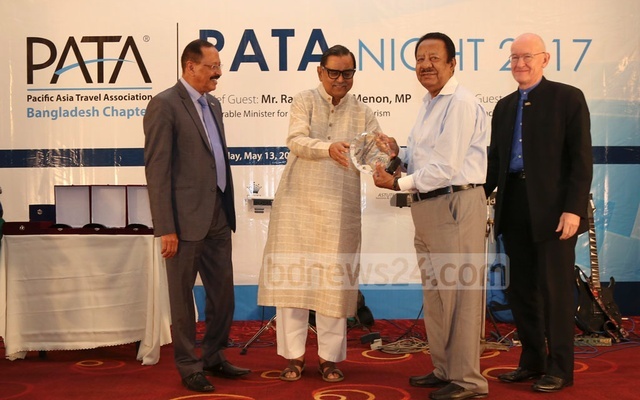 bdnews24.com, Bangladesh’s largest news publisher, was honoured at the programme as the News Media of the Year for its extensive focus on travel and tourism. Its Editor-in-Chief Toufique Imrose Khalidi received the award from Minister Menon. “We are delighted and feel honoured … this will only encourage us to do more of what contributed to this recognition,” Khalidi said after receiving the award. 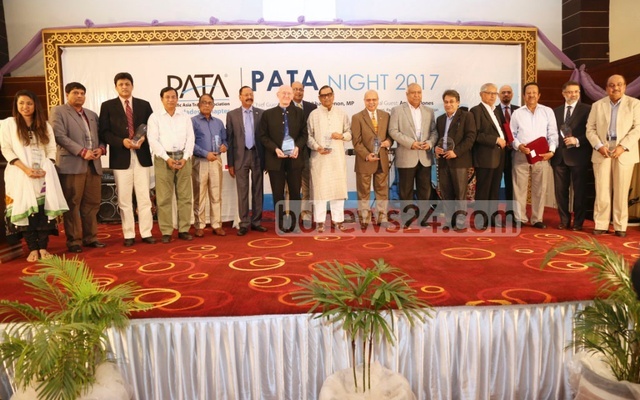 “Such actions and enthusiasm are fundamental to the principles of PATA in promoting responsible and sustainable tourism throughout the country,” said Jones, who was the special guest at the programme. He said he was ‘very’ impressed with the PATA’s student chapter. 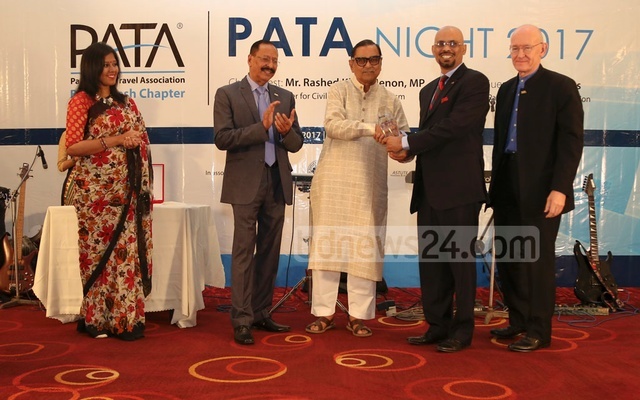 PATA awarded scholarships to Bangladeshi students for higher education in tourism. PATA Bangladesh Chapter Chairman Shahid Hamid delivered the opening speech. “We have seen double-digit growth in domestic and regional tourism,” he said. Hamid will run for the position of PATA vice-chairman at the association’s annual meeting in Sri Lanka next week. 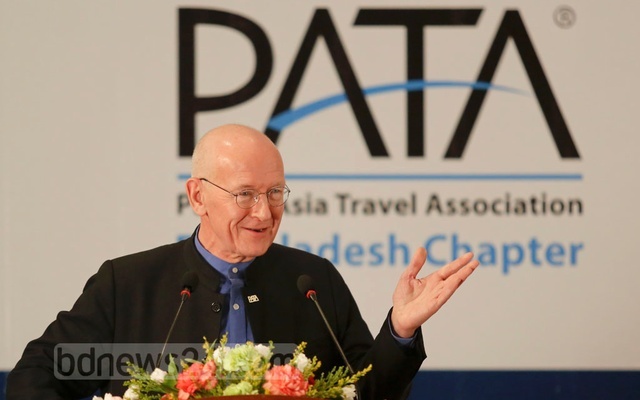 Founded in 1951, Bangkok-based PATA is a not-for profit association acting as a catalyst for the development of travel and tourism to, from and within the Asia Pacific region, according to its website. For their lifetime contributions to the tourism industry, four individuals were awarded by PATA at Saturday’s programme. Winners of Lifetime Achievement Awards are: Abdul Mannan, former state minister for aviation and tourism who led the formulation of Bangladesh’s first tourism policy and chairman of Bengal Airlift, Abdul-Muyeed Chowdhury, former managing director of Biman and adviser to 2001 Caretaker Government and CEO of Tiger Tours, Shahabuddin Ahmad, editor of The Travel World, and Raquib Siddiqi, chief editor of Bangladesh Monitor. Separately, 11 individuals and organisations received awards in different categories. 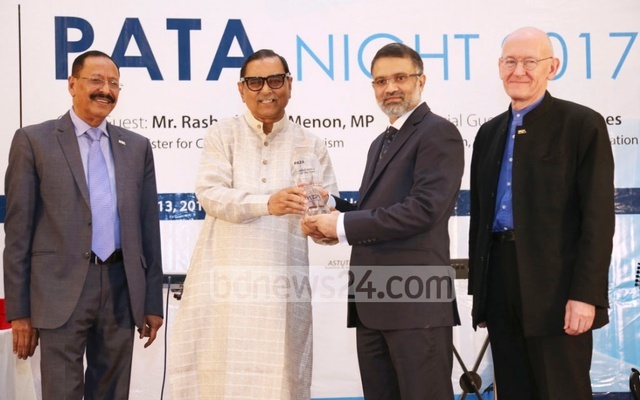 Dr Mojib Uddin Ahmed, a teacher of Dhaka University’s Tourism and Hospitality Management Department, was honoured for his excellence in tourism education. The Hospitality Entrepreneur of the Year Award went to Kazi Tareq Shams, managing director of Lakeshore Hotels. Atique Rahman, group executive director of Lakeshore Hotels, has been recognised for his excellence in hospitality industry. Kazi Wahidul Alam, founder editor of The Bangladesh Monitor, known for his relentless work for more than 25 years in the sector, won the Excellence in Tourism Development Award. Faridul Haque, managing director of Tour Planners, was awarded in the same category: Excellence in Tourism Development. The Culinary Excellence Award went to Tony Khan, general manager of Ratnodweep Resort. US-Bangla Airlines has been recognised as the Airline of the Year. Bengal Tours, a leading tour operator, won the award for its Outstanding Contribution in Tours and Travel. Another award in the same category — Outstanding Contribution in Tours and Travel — went to Journey Plus. The Digitisation and Marketing Award went to Astute Horse Business and Marketing Solutions. 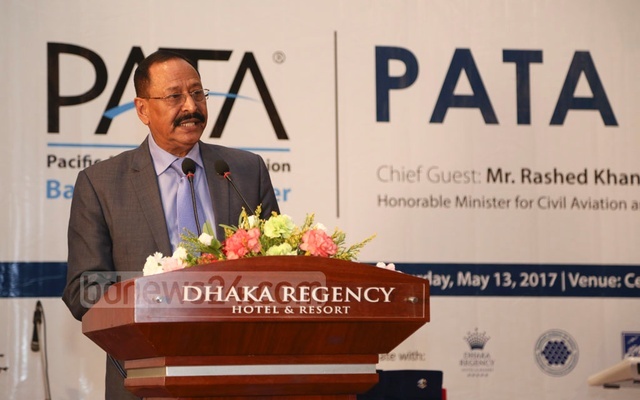 “This is the first of its kind event that PATA has organised in Bangladesh to recognise industry leaders,” said Shahadat Hossain, managing director and CEO of Astute Horse which put together the show. A bdnews24.com documentary video on Bangladesh’s tourist spots and ancient landmarks was shown in the programme. PATA Chairman Jones, after seeing the video, said he had not seen this beauty of Bangladesh before. This is the Hong Kong-based British businessman’s fourth tour to Bangladesh. He said the video would play a vital role in branding Bangladesh in tourism. Astute Horse CEO Shahadat Hossain also admired the video.